One last photo from Las Vegas. This was taken at City Center at the tram station. I loved how there were lines in very direction you look. Thanks for indulging my little side trip Las Vegas Nevada. Click on it to make it bigger. Two more pieces from the Chihuly gallery in Las Vegas. 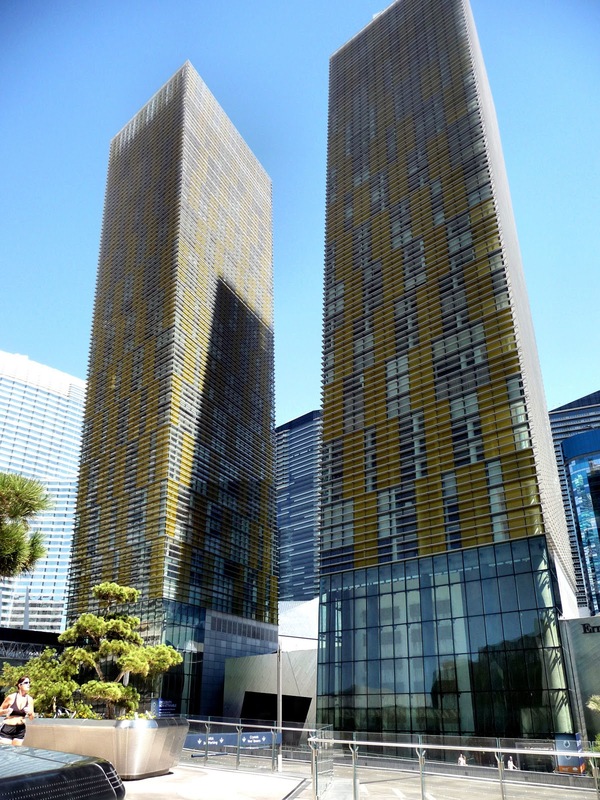 I wasn’t in quite the right position to get a shot of these two buildings located in the City Center project in Las Vegas. You can barely make out how they lean slightly. Click on this link and you will get a much better idea of just how “tilted” these two towers are. Two more photos from The Gallery in Las Vegas featuring the work of Dale Chihuly. Dave of Tamarindo Costa Rica Daily Photo was correct in his comment yesterday. This gallery is located on Gallery Row in the new City Center area of Las Vegas. The top photo is a close up view of one of the pieces so beautifully diplayed in the case featured in the photo below. There were so many beautiful things represented in this gallery. For those of you on the east coast, there is a show right now at the Museum of Fine Arts in Boston. According to their website, it looks spectacular. I spent the last three days in Las Vegas to attend a conference. On Friday morning I had some time to explore and I found a gallery devoted to the artistry of Dale Chihuly. Once inside I saw this gorgeous version of the Desert Wildflower Towers that we have at the Desert Botanical Gardens. There were more amazing pieces in the gallery and since they encouraged photography, I’ll show you a few more over the next few days. Just in case you weren’t sure where the entrance was, this arrow points the way to Postino’s on Central. 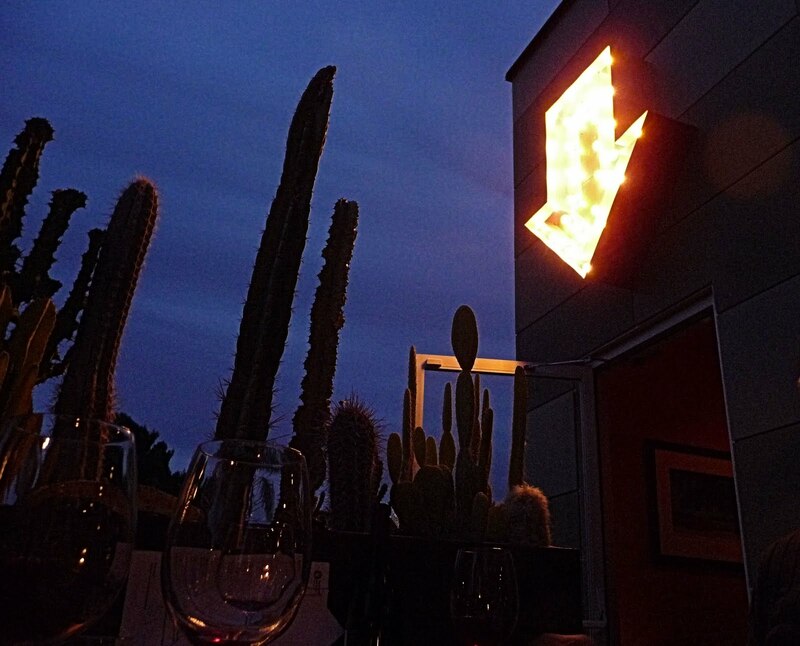 It’s a very popular wine bar in Phoenix. I found this painting of Frida Kahlo on a brick wall in downtown Phoenix. I believe the space between two other buildings is now being used as a performance place for bands. 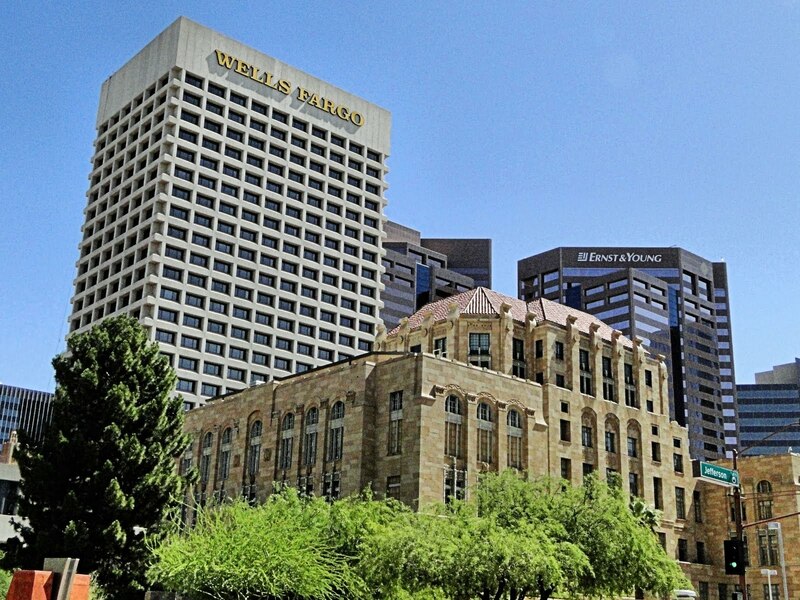 Tall buildings in downtown Phoenix. This tower located in a newly remodeled movie theatre in Scottsdale, reminded me of the “Rapunzel” fairy tale. Several local movie theatres have undergone some serious remodeling and now offer adult drinks, hot food delivered to your seat, and party rooms. 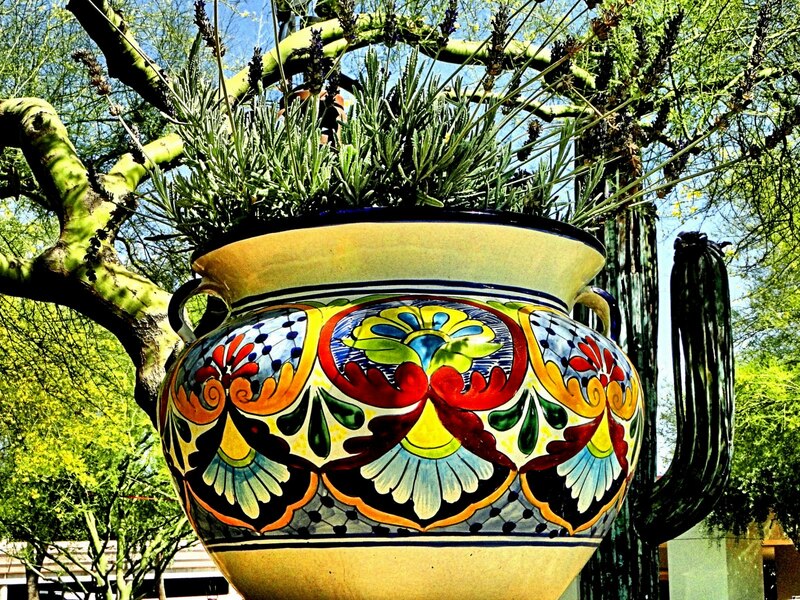 A colorful pot filled with lavender sitting on the wall of a Scottsdale Art Gallery. Nicely spaced and nicely reflected. …..if my car isn’t white? It must have been white car day at the supermarket! 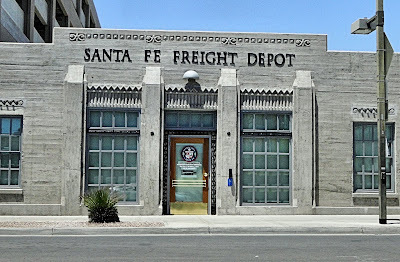 The Santa Fe Freight Depot building is located in downtown Phoenix very near the old rail station. It opened in 1929 and was a busy place where goods were received and shipped during the era of rail transport. It sat vacant for over 40 years and was recently refurbished. It now houses the offices of the Maricopa County Assessor. I immediately thought of Georgia O’Keefe when I saw this ram skull on the side of a Scottsdale Art Gallery. Do you think it would have inspired her to pick up a paintbrush? The front garden on this North Mountain home is very impressive. I don’t think I’ve ever seen that many saguaros in one yard. 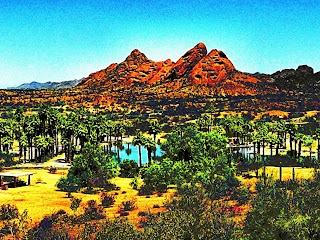 I was driving around in the North Mountain area last Sunday and found a group of homes built on the south slope of North Mountain that I hadn’t seen before. This one was quite striking sitting on a corner lot. On the other side of it, I could see the pool area. The pool was wedged in to a very small space. Anyone remember that song that Phoebe used to sing on the old “Friends” television show? 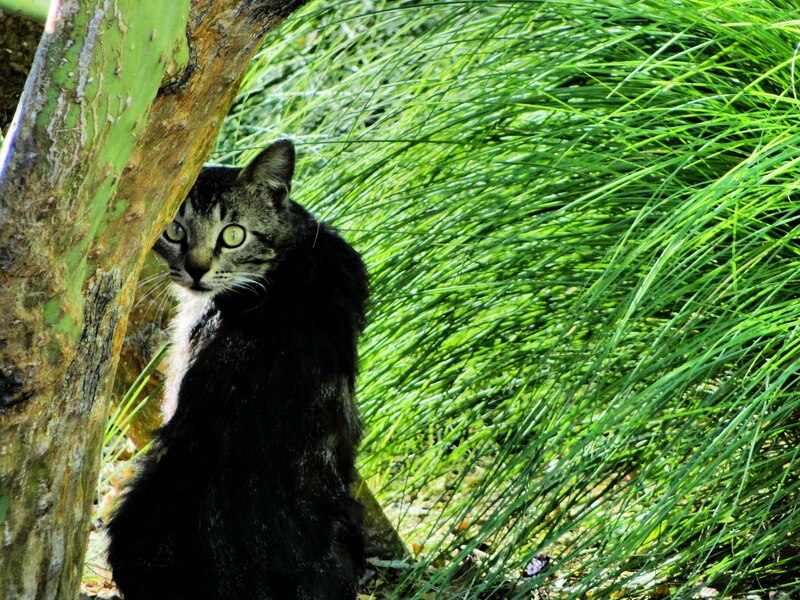 That is what popped into my head when I saw this cat one day when I was out taking photos. I pointed the telephoto lens toward him as he watched me over his shoulder. This building made me think of the musical “Little Shop of Horrors”. I have no idea what the building is used for. There were no signs anywhere. Click on it to get a better look. This is an art installation called “Arizona Beach” by Hirotsune Tashima. 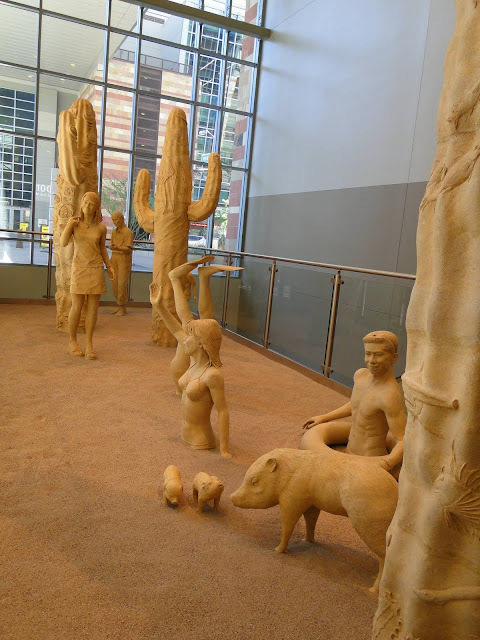 Located inside the newest building of the Phoenix Convention Center, it is comprised of several stoneware ceramic sculptures depicting people engaged in various activities alongside desert animals and plants. The artist notes that it is supposed to point to the power of growth and encourage people to live fully. Mr. Tashima studied art in both Japan and the United States and currently teaches Ceramics at Pima Community College in Tucson Arizona. Three palm trees living close together. I could have used this photo for my “Under Construction” theme day photo if I had seen it in time. I just saw this church being constructed from a distance and drove over to get a closer look. It ‘s called the Light of the World Church and it’s a nondenominational Christian Church being built on the west side of Phoenix very close to Interstate 10. I don’t know much more about it except that it is going to be huge. On the same day I took the two previous photos at Papago Park, I also took these two photos of what I think is a green heron. In the above picture, he was just about to leap into the air and fly away but, I followed his flight and found him again on the other side of the lagoon and got a second photo. 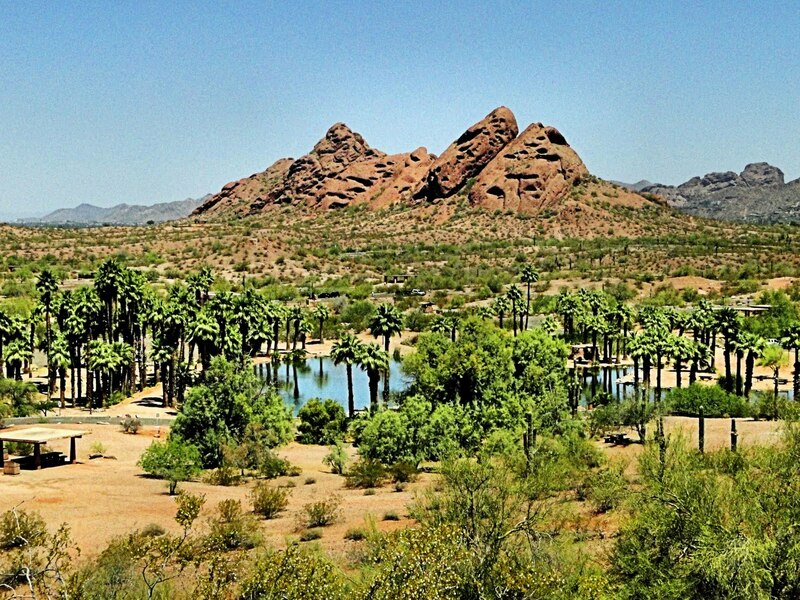 When you are standing up by Governor Hunt’s tomb (see yesterday’s post) this is the view looking west over Phoenix. I was actually amazed at how that butte in front of us completely hides the city from view and, believe me, there is one big city out there. I was also taken by how much this photo looked like a 1930’s post card. So, I used my software and played around with it and actually got it to look exactly like a hand-colored antique post card. Arizona’s first governor was every bit as “mavericky” as our colorful and controversial leaders today. 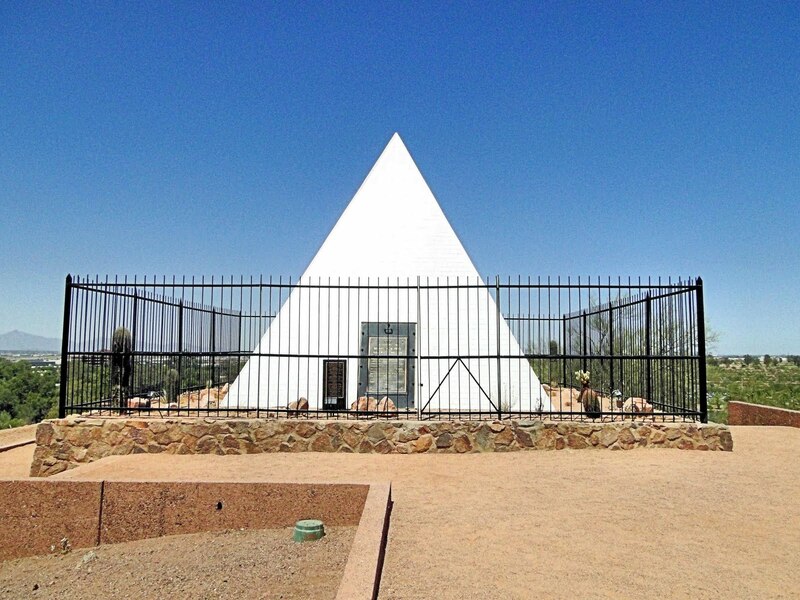 When Governor George W. P. Hunt died, he joined his late wife in this pyramid shaped tomb high on top of a butte on state land that has since become Papago Park in the city of Phoenix. 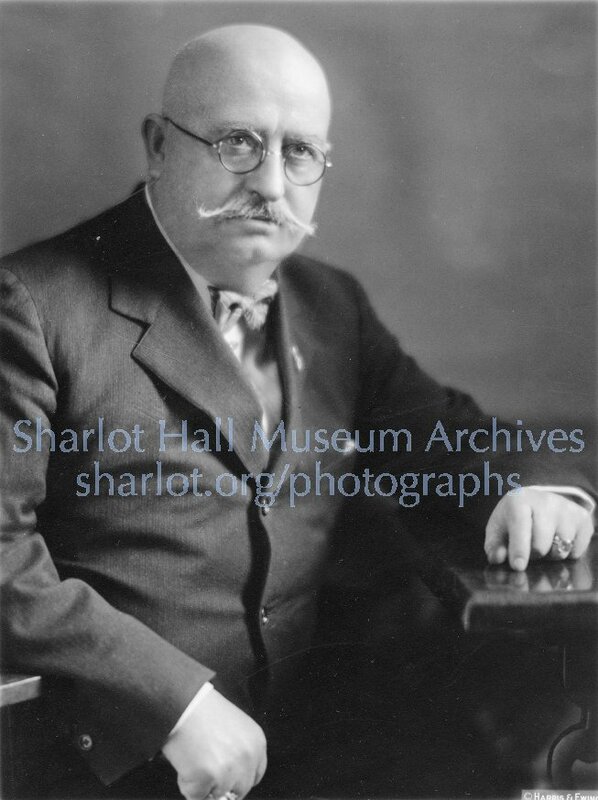 Hunt still holds a national record for the number of times he was elected to the office (7 in total) earning him the moniker “King George VII.” It is thought that he got the idea of a pyramid shaped tomb when he traveled to Egypt in 1930. After that trip, he obtained congressional approval to build his tomb on its present site. In 1910 Hunt served as President of the Constitutional Convention where the Arizona Constitution was drafted. The constitution was quite liberal and included a provision to allow the recall of judges. President Taft would not allow statehood until that provision was eliminated. It was removed and statehood was granted on February 14, 1912. The provision was immediately legislated back into the constitution, in a move that many called “shifty”. The Tomb is 20 feet tall and is covered in white polished “bathroom” tile. The fence was erected more recently to protect it from vandals. You can imagine the graffiti problem something like this posed before the fence was there. This squirrel was acting as lookout atop a pile of rocks at Papago Park. It made me wonder what mischief his friends might have been getting into. Doesn’t this look like Juliet’s balcony? An interesting concept for a barber shop. I hope the barbers aren’t getting buzzed while wielding those sharp scissors behind your back! I walked out into my back yard the other day and I saw something moving out of the corner of my eye. When I turned to look, I saw this little bird balancing on an agave bloom and munching on the flowers. I went back in and got my camera thinking he would be gone but, there he was still munching on the blooms and smiling for the camera. The theme for June is under construction and I have to admit, this theme was somewhat of a challenge. Not because I couldn’t find any construction but, because construction sites are just not very photogenic. I’ve featured this building under construction before and I thought it might be the best choice for this theme. This is the new Maricopa County Superior Court Tower under construction in downtown Phoenix. 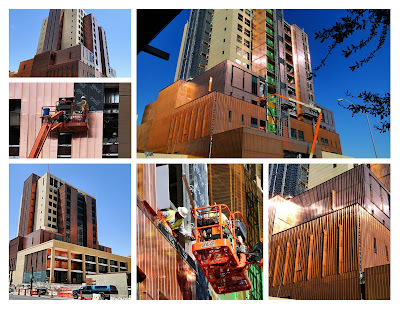 This is the one that is being clad in copper siding. To read about the building, check my original post here. The photos in the lower left and top left of the collage were taken a few days ago. The other photos were taken for the last several months whenever I happened to be in the neighborhood with my camera. I noticed in the two I took a few days ago that some of the copper has already oxidized and no longer shows a shiny patina. The photo in the lower left shows the front of the building and across the frame around the lower floors is embedded this statement: THE FIRST DUTY OF SOCIETY IS JUSTICE.